A hand-knitted scarf adds style to your wardrobe, but you may decide after wearing it that the scarf is too short. 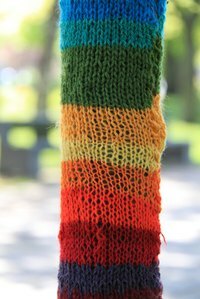 If you still have matching yarn, you can add to the length of your scarf. The method you choose to do this depends on how easy it is to undo your bound-off stitches so that you can start knitting again. If you're unable to undo the bound-off edge, you can still pick up stitches in the scarf and knit additional length. Locate the end of the yarn used to make the last knot in the bound-off row. Use a crochet hook to tease the yarn free from where it was woven into the end of the scarf. Insert the crochet hook into the last stitch and work the yarn loose. You have to undo the bound-off stitches one at a time. When you have unraveled all of the bound-off stitches, you will be left with a row of loops. Slip the loops onto your knitting needle. Begin knitting, following the pattern in which the scarf was knit. Knot the ends of your yarn and a new skein of yarn together and continue knitting until the scarf is the length you want it to be. Tie the end of a matching ball of yarn to one side of the end of the scarf to which you want to add length. Insert the tip of your knitting needle under the first bound-off stitch. Wrap the yarn around the needle as if to knit and pull the needle through. You now have one stitch on your needle. Repeat the process of slipping the needle under the bound-off stitches, wrapping the yarn and pulling it through, until you have as many stitches on your needle as the width of the scarf. Continue knitting the scarf in the pattern it was previously knit, until you have added as much length as you need. Bind off the stitches as usual. Use yarn from the same dye lot as was originally used for the scarf, in order to prevent a noticeable demarcation line at the added-on section.